I flinched. It had already been discussed between my two kids and I that this summer was going to be a close-to-home adventure summer with lots of backpacking, hiking, swimming, biking, and camping. My daughter’s backseat declaration that she did not want to do the outdoorsy things that we had planned across the non-school season was startling. My kids have grown up in the dirt since they were babies, dragging dolls across shallow river beds, hunting for pirate treasure and fairy homes in the hollows of nurse logs, and finding every opportunity to take mud baths with frogs. Why now, at 9 years old, was she telling me she wanted to opt out? “Well,” I responded, “given that we’re driving up to the mountain right this very moment to camp out for the night, I’d say we’re not off to a very good start of avoiding summer camping trips.” She shrugged and went back to being annoyed at her 12 year old brother, whose latest favorite pastime meant sticking his head out of the rolled down window like a dog until his hair stood on end. We were on our way to meet up in the Mt. Hood National Forest with the team from Expedition Old Growth. The plan was to camp out for the night and then wake early and climb up into a reallllly tall tree. I had the opportunity to climb with Expedition Old Growth in the fall of 2016, and the experience had permeated me, transformed my perspective about the forest and my relationship with it. I wanted my kids to feel just as affected, sooner rather than later, and to witness the woods from up above the understory. The matter of fact truth is that kids are natural born tree climbers. Any parent can attest, as soon as toddlers are confident in their toddling, they’ll set their sights higher. They’ll instinctively know how to dig their fingers into the right holds, whether they be the knotty sides of fallen logs or the unrelenting rigidness of a rock crevice. Up is exciting. Up reveals a different view. Up means there’s so much more to explore. But we can only climb so high with our limiting limbs. And our curiosity-fueled ambitious scrambles are not without affect: our hands brush away century-old moss and lichen, our knees scrape off bark and branches, our feet crush tender shoots. 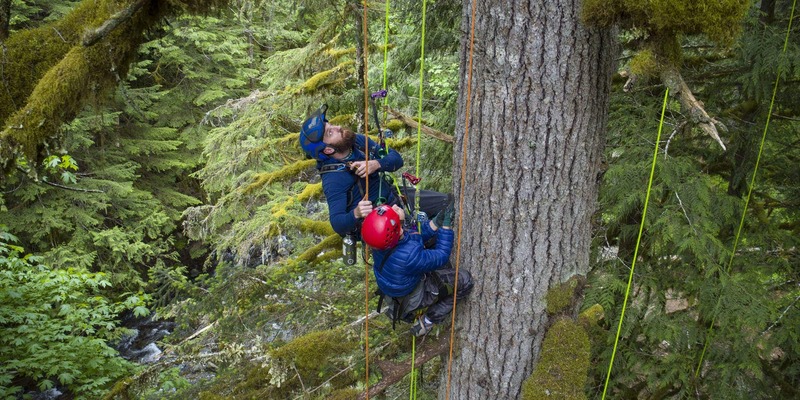 By climbing instead with professional arborists we can ascend higher than if we tried to Tarzan up, and we can ascend safely, with the proper care to minimize our impact. No sooner had we pulled into the lot at the campsite then both kids were out and running, off on a trail that disappeared into ferns and blue violets. I spotted them shortly thereafter scrambling along the river’s edge, walking sticks in hand. My daughter was clearly having a hard time committing to her earlier disdain for a summer of camping. I could see radiant waves of pure unfettered imaginative bliss emanating off of them as they danced along the fallen logs and skipped over smooth river rocks, the way you can see dust particles when the sunlight shines behind them. I love seeing my children in this light, even more than I love seeing them enjoy kale. Joy, good health, curiosity and fresh air. Wild childhood cultivates healthy humans who live without limitation. The experiences we provide to children serve as the foundation for their passions, interests and belief systems. It is this which ultimately guides their paths through adolescence and into adulthood. 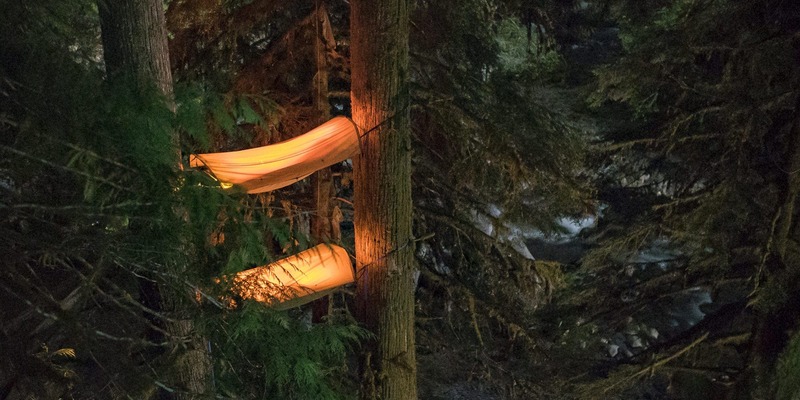 Climbing up a Douglas fir is an immersive experience that hits the sweet spot where adventure and education intersect. It isn’t a flash in the pan thrill like bungee jumping, it isn’t an Instagram opportunity that begs to be the next aspirational hashtag. It’s the opportunity to saturate the senses as ascension reveals new details. A shift in perspective that kicks in somewhere around the first of the low branches, somewhere around forty feet off the forest floor. A euphoric alteration of the status quo as gravity is defied and toes carefully tip tap upward along the tapered trunk. The tangy taste of a fresh fir needle. The sweet and undiluted smell of sap; tangible and sticky evidence of the vascular similarities between a centuries old evergreen and a decade-old child. Going nose to nose with the thick and deeply furrowed bark of a living, breathing, sentient being. Damien Carré, owner/operator of Expedition Old Growth, laid the ground rules early: Watch where you step. Stay on the trail. If maneuvering around the base of a tree that’s rigged to climb, take care to not step on emerging vegetation. Tip toe against the trunk, but don’t kick, don’t grasp or pull. Use the rope to ascend, not the branches. Remember, we were not invited here to climb, but we are not unwelcome either. So show respect. Be a good neighbor. And be a better guest. 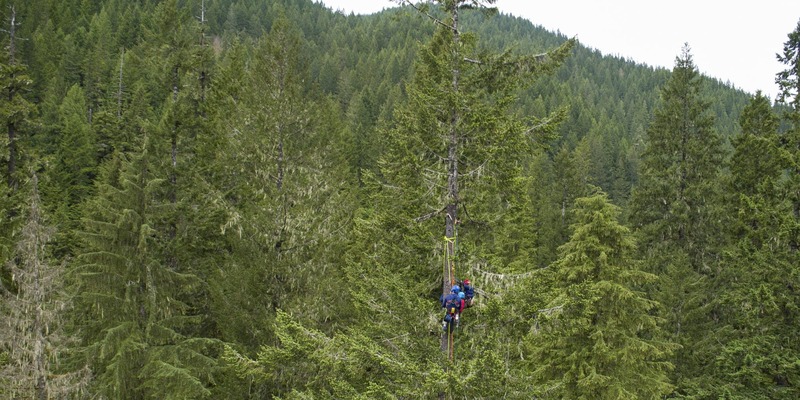 Just about anyone over the age of five can ascend with Expedition Old Growth. Climbers are secured in a harness with both foot and knee ascenders to shift the climb effort from the upper body to the legs. Or there is the option to be “elevatored up,” in which one person who is already in the tree serves as the counterweight for someone below. My son climbed up like the natural monkey he’s always been. My daughter took the elevator and delighted in the feeling of flight as she was hoisted up while I was lowered down. Once I was back on the forest floor I gazed up to where the ropes disappeared into the canopy. My children were way up there! Hanging out in their harnesses with Damien and “Slug Master Ben” (who earned his new nickname after successfully convincing my newly squeamish 9-year-old that slugs were actually pretty dang cool). 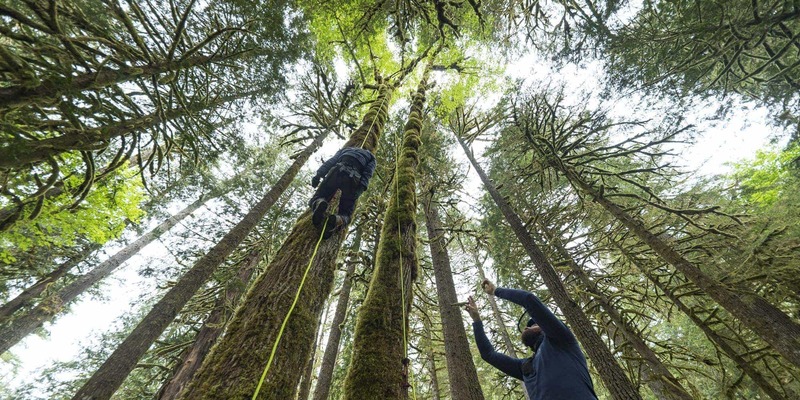 No internet, no apps or games, no schoolwork … just fluffy moss that clung to high branches like pollen on a bumblebee and an adventurous education 200 feet up inside a Douglas Fir with these fun and passionate guides. Right now the world is hard. Maybe parents say that regardless of generation, but this is the only one I’ve known. And these are my only children. And it does. It feels hard. It is a challenge to keep my kids informed without taking a jackhammer to their innocence. 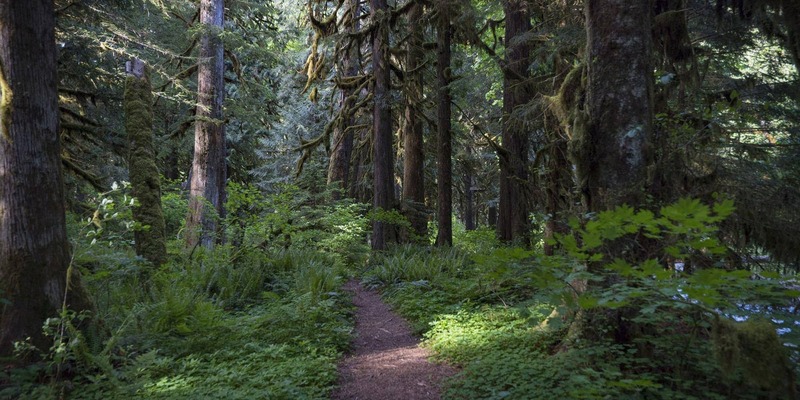 I want my kids to be immersed in this world and to be compelled to find constant connection, to be stewards, to know why fighting for the protection of our public lands is critical, to understand the sacredness of clean air and water and how we will lose those essentials without the symbiotic relationship we have with trees. I want them to understand their own role as good neighbors and protectors, and I want them to live passionately, but without fear as the motivation for action. When it comes time for them to consider a first job, I want for them to look beyond the fast food and retail status quo options, and instead consider an apprenticeship as an arborist or a river guide, or anything that springboards off of a passion for the outdoors, one that was nurtured when they were kids, sparked perhaps while brushing shoulders with a Giant of the Forest. As my kids floated one by one back down to earth, dappled in sun rays, they each, unbeknownst to the other, sang a song. We hugged and high-fived, and gave our respects to the firs and cedars and broad leaf maples, to the creek rushing by us, to the chipmunks flitting out of snags and stumps. I turned to my daughter, “Do you still not want to go camping very much this summer?” I asked. Kelli Martinelli believes the story is only a good one if you believe in it. She uses her way with words as a writer and communications consultant to support brands and organizations she believes are doing good things for the world. 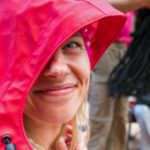 Humboldt County-grown and Portland-seasoned, Kelli hopes to raise her two kids to pursue passion, embrace adventure and let compassion compel them to create meaningful action.